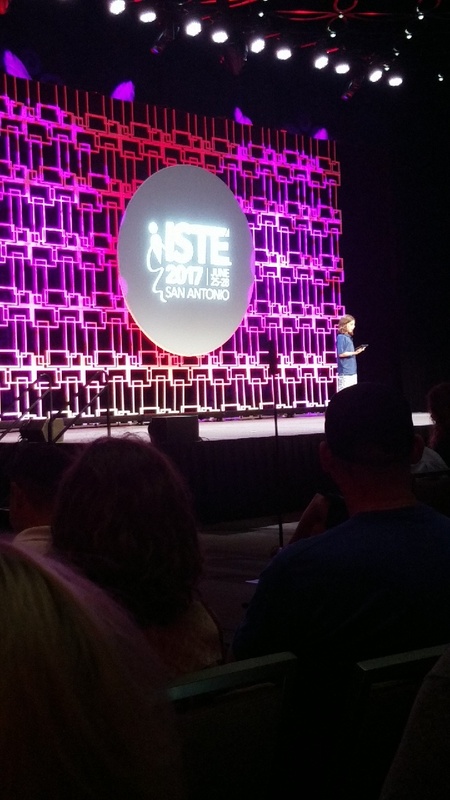 I love these events at ISTE because you get a quick introduction to a bunch of ideas all in one session. Often when I sit in long-form sessions, I feel like it can be information overload, or too deep a dive into the content. When I’m in an Ignite session, I get the basic info and contact details for the presenter, so if I want more, I can reach out. Publish our work, not fill in worksheets to give to a teacher. No man should be an island… no student should either. Don’t ask us to memorize things we can Google. We need a global army of Ss using tech for good! Another great presentation came from @SteamNerds. This 8 year old boy was told while in 1st grade that he couldn’t be in the STEM club because he was too young, so he taught himself. By 2nd grade, he had made his way in and was teaching the 4th and 5th graders how to use advanced features. Despite his success, the rules didn’t change, and only 4th and 5th graders were allowed in, so he created his own STEAM camp at his house and invited students of any age. His work off-stage is amazing, and he also stood in front of over 1000 teachers and told his story. Wow! Seems like the theme of Ignite this year is empowerment, and that’s great, but I feel like maybe it was a bit of a miss. There were some awesome quotes, and the student presenters especially were amazing. They make me want to push my students to do more. More than ever, I believe my students have no limits. In the past though, these Ignites also had action steps, a plan for how to duplicate what was done. I pulled ideas out of them to start a student tech support group, or a specific tool I had never heard of. We didn’t get that this year. That isn’t the end of the world, and I’m still glad I attended. Instead, what I’ve taken away is that our students are begging us to change education. The teachers presenting are echoing this in their own ways, but the students are quite literally saying this to us. The rules, walls, limitations, beliefs, and rigid nature of education is killing education. That’s what needs to change.